CAMEO Professional Auxiliary of Assistance League of Long Beach will host a professional fashion show and luncheon on Saturday, March 30, at the Westin Long Beach, 333 E. Ocean Blvd. Sueko Oshimoto’s designs include kimono dresses. Reception and silent auction at 10 a.m. Doors open for luncheon and fashion show at 12 p.m.
As this is the primary fundraiser for CAMEO’s mentoring and enrichment program, the over 550 generous individuals who attend will help deliver services and scholarships to the Long Beach Unified School District high school and Long Beach City College students who participate in the program. Tickets are $130 and $215 each, depending on the package selected, and are available for sale until the event sells out, at www.allb.org/CAMEOfashionshow or through the Assistance League of Long Beach at 6220 E. Spring St., Long Beach, CA 90815. This year’s fashion show theme is “Koi: A Journey of Character and Courage.” The koi fish has a powerful and energetic life force, demonstrated by its ability to swim against currents and travel upstream. It symbolizes lessons and trials that a person may encounter in life and overcoming them. “To CAMEO mentors, koi represents the journey of building character and courage that our students go through over the three-year program,” shared Lisa Viets, resource and development chair. The day will include a silent auction with hundreds of packages ranging from $40 to $2,000 and a live auction featuring one-of-a-kind experiences and trips. 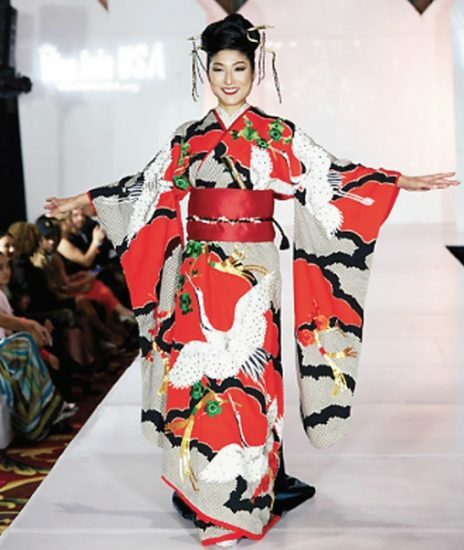 The high-energy fashion show by Couture Productions will feature three exciting collections with Japanese influences, including elegant fashions from Japanese designer Tadashi Shoji (https://www.tadashishoji.com/). A beautiful handmade, kimono-inspired dress line by designer Sueko Oshimoto (https://www.kimonoinspireddress.com/) will grace the stage. Also featured is an exclusive Japanese line called Masaki Matsuka (https://masakimatsuka.com/). The fashions are wearable and sophisticated with fun designs. Nancy Hayata and her students will perform Japanese classical dance. The CAMEO program is designed to guide underserved Long Beach high school and community college students through a one-on-one mentoring program to help them identify and fulfill their college and career goals. In addition to mentoring, the students attend monthly enrichment workshops and cultural activities, complete paid summer internships, receive funds for the purchase of books and academic materials and, upon successful completion of the program, receive academic scholarships and computers.